i like the subdued colors and the details. great piece! wow, I really like the contrast of the delicate panels, the grey lines and the black areas. wow, this is very classy and beautiful! Gorgeous piece. I love the patterns and subtle variation in the colors! I love your use of texture here, it gives a lot of depth. Wow, Ursula, this is a beautiful illustration. I love the shading and all the wonderful details, the landscape through the window, and all those amazing patterns on the wallpaper, curtains, floor. This is a great homage! i love your art! this is wonderful!!! Thank you for your homage to Brown. He was my great-grandfather. Last Thursday (May 22) was his 200th birthday! 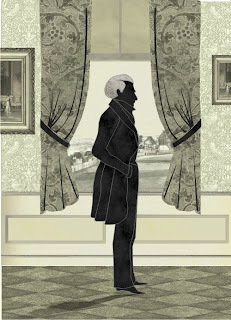 I can't think of a more fitting tribute than your illustration based on his silhouette.